John SUTTON (1593 – 1672) was Alex’s 11th Great Grandfather two ways, he was two of 4,096 in this generation of the Shaw line through his daughters Mary and Margaret. John Sutton was born in 1593 in Attleborough, Norfolk, England. One source shows is birthplace as Rehoboth, Bristol, England. John’s parents were Henry SUTTON and Sarah TILDEN. He was the grandson of Theron SUTTON. He was an only child. He married Juliana ADCOCKE about 1616 in Attleborough, England. 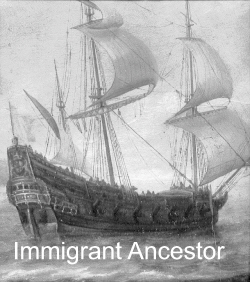 He arrived with his family in 1638 on the ‘Diligent‘. John died on 1 Jun 1672 in Rehoboth, Mass. Alternatively, John’s parents were George SUTTON and [__?__]. Julian Adcocke was born in Great Ellingham, Norfolk, England. 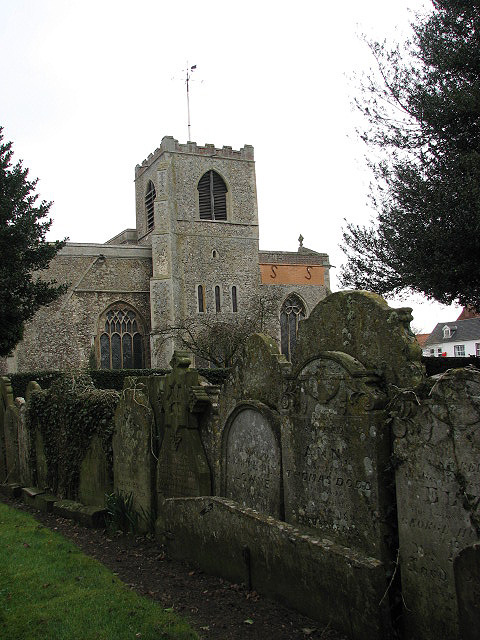 She was baptized on 11 Feb 1598/99 at the Assumption of the Blessed Virgin Anglican Church in Attleborough, Norfolk, England. Her parents were John ADCOCKE and Elizabeth ELDRE. Juliana was buried 4 Jun 1678 in Rehoboth, Mass. Some sources say John’s wife was Juliana Little who was born around 1595 and her father was Francis Little. In addition, some think that John may have had another wife before Julian, for the time period between the birth of John, Jr., (1617) and the next child, Esther (1625) is eight years. (For what it’s worth, there are also 6 years between Anna and Margaret) In addition, Hannah (1637-1642) is sometimes omitted from the list of children. This omission could possibly mean that her birth date was really 1638, after the family’s arrival in Massachusetts. ca. 1645 4 Nov 1703 Rehoboth, Mass. Daniel Cushing, a contemporary of John SUTTON’s at Hingham, records that Sutton, with a wife and four children, came from Attleborough on the Diligent in 1638. Immediately above the Sutton entry, Cushing lists Stephen Paine and his family, from Great Ellingham [adjacent to Attleborough, in Norfolk], as passengers on the same ship. The will of former Attleborough resident John ADCOCKE of Great Ellingham, dated 12 October 1638, names (among others) “Stephen Payne my sonn in lawe” and grandchild Elizabeth Sutton. 1598/99 and 1602/03, respectively. Rehoboth vital records list the death in 1660[/61?] of Neele Paine, wife of Mr. Stephen Paine, and the burial in 1678 of Julian SUTTON. On 3 June 1673 letters of administration were “graunted unto Julian Sutton, widdow, the late wife of John Sutton, of Rehoboth, deceased”. It is thus apparent that Neele Paine and Julian Sutton were sisters, both of them daughters of John and Elizabeth (Eldred) Adcocke. Without explanation, the distinguished genealogist Mary Lovering Holman describes Julian [__?__] as John Sutton’s second wife but fails to mention a first wife. Holman undoubtedly knew that Charles E. Banks had identified Sutton’s Diligent-passenger wife’s forename as Elizabeth. In attempting to reconstruct the identities of Sutton-family passengers, however, Banks mistakenly used Scituate, Plymouth Colony, records of John Sutton’s namesake son, his wife (Elizabeth House), and four of their children. Julian Adcocke married John Sutton early enough to have had daughter Elizabeth with him by 1638. Although this does not guarantee that she was also the mother of his daughter Margaret (birth/baptismal date unknown), it does make it likely. John Adcocke’s granddaughter and legatee Elizabeth Sutton was presumably named after his wife (Julian’s mother). Since grandparents’ names were usually given to children early in the birth order, Elizabeth was probably older than Margaret. If so, logic dictates that Julian was also Margaret’s mother. Nevertheless, the name Julian does not appear among any of John Sutton’s known or supposed children and grandchildren. (Thanks to Eugene Cole Zubrinsky for this research. For more details, see his article “Julian Adcocke, Wife of John1 Sutton of Hingham and Rehoboth, Massachusetts, and Their Family,” forthcoming in The New England Historical and Genealogical Register.). In 1638 while Hannah was still a baby (or perhaps not yet born) and John, Jr., was already a man of 21 years, the Suttons decided to move to America. They were part of a group of 133 passengers who traveled to Ipswich, the capital of Suffolk County in SE England, and booked passage on the ship Diligent, captained by John Martin of Ipswich. (The ship’s passenger list is one reason for confusion about the children. The ship lists John, wife, and four children. Hoping to provide specifics, early biographers went to other sources for the children’s names. At least one or more listed John, Jr.’s, children as John, Sr.’s, offspring. John, Jr., at age 21 would probably not have been listed as a child on the ship. In addition, his marriage took place in America; he did not bring children or a wife with him on the Diligent. It is interesting that the Suttons left the Hingham area of Norfolk County, in SE England to come to Hingham, Suffolk County, in SE Massachusetts, New England. Geographically Hingham was a little less than half way between the two older settlements of Plymouth and Massachusetts Bay, and wisely it tried to maintain that separation in other ways, too. Settlers from around the town of Hingham, in Norfolk Co, England where the Sutton family had lived, had been coming to New England and settling near each other since 1633. No doubt these people had written to their friends and relatives in their former home. Their new settlement in Massachusetts was originally called Bare Cove [not Bear Cove] because that was how the area looked; almost its entire harbor was exposed at low tide. By 1635 enough colonists had come to the Bare Cove settlement for the place to need some supervision. Hence, the May court of that year swore in Joseph Andrews as constable of the place, and the town passed a resolution officially changing the name from Bare Cove to Hingham. The number of persons who came over in the ship ‘Diligent,’ of Ipswich, in the year 1638, and settled in Hingham, was one hundred and thirty-three. All that came before were forty-two, making in all one hundred and seventy-five. The whole number that came out of Norfolk (chiefly from Hingham, and its vicinity) from 1633 to 1639, and settled in this Hingham, was two hundred and six. Modern historians say that there was a much larger number of settlers here [in Hingham] in 1639 than would appear from [the clerk’s] estimate….Many of the first settlers removed to other places during the militia difficulties which occurred within a few years after the settlement of the town; and a considerable number had previously obtained lands at Rehoboth. In addition, a possible (and major) reason for the discrepancies might be that Mr. Cushing, the clerk who made the ship’s list for the town records, was 19 years old when the ship Diligent arrived; however, he was in his 60’s when he attempted to make a complete list of those on board. When Roger Williams was thrown out of Plymouth in 1635, he searched for land where he and his followers could be free to worship as they chose. They wanted land outside the boundaries of Plymouth and Massachusetts Bay. He went first to today’s Rehoboth/Seekonk area, on the east shore of Narragansett Bay and the Pawtucket River. He purchased land there from the Indians, but Plymouth claimed the land he had purchased and threw Williams and his followers out. All the people who came after Williams suffered the same fate. They would buy Indian land and then would be thrown off the land by either Plymouth or Massachusetts Bay. Finally, Williams was forced to move across the river to Providence where he established Providence Plantations, and there in 1639 he established what is generally recognized as the first Baptist church in America. When Newman acquired the land near the Pawtucket River, he named it Rehoboth. This name is mentioned three times in the Bible—the most fitting being in Genesis 27:22 which speaks of disputed land. “And he [Isaac] moved away from there, and he dug another well, and they did not quarrel over it; so he named it Rehoboth, for he said ‘ At last the Lord has made room for us, and we shall be fruitful in the land.’” Newman and his followers purchased the land (approximately a square mile) together as a proprietary body. Each congregation member had a definite land allotment as part of that proprietary body. After laying out the property lines, the church members drew lots to decide fairly who would receive which parts of the land the group had bought. John’s wife Elizabeth House (Howse) was born in 1636. Her parents were Samuel House (Howse) and Alice Lloyd. Elizabeth died in 1679. The couple had eight children: John, Mary, Sarah, Hannah, Hester, Benjamin, Nathaniel, and Nathan. Elizabeth and all eight children are named in John, Jr.’s, will. After selling his father’s house, John and Elizabeth moved to Scituate, Plymouth Co., MA where they remained until John, Jr’s., death 12 Nov 1691. Elizabeth, it is said, moved to Rye, NY where she died. She may have remarried. Son Benjamin would change the family name to Sitton. Richard and Esther had nine children: Richard, Hester, Sarah (1), Sarah (2), Obadiah (1), William, Thomas, Mary, John, Obadiah (2). Sarah (2) and Obadiah (2) were named after siblings who died at an early age. Richard died and was buried in Rehoboth. Esther’s date of death and place of burial are unknown. Anna’s husband John Daggett/Doggitt was born in 1626 in England. His parents were John Daggett and Bethsheba Pratt . (Some sources give John and Hepzibah Brotherton Doggitt as John’s parents. The elder Daggett was married twice.) John died 9 Sep 1707 in Rehoboth, Bristol, Mass. The Daggett House is an historic house in Slater Park in Pawtucket, Rhode Island. The house is the oldest house in Pawtucket, and one of the oldest surviving buildings in the state. The house is supposed to have passed by inheritance in 1707 from its original owner to his eldest surviving son, Joseph Daggett, a doctor of medicine, a wheelwright, and a miller. Joseph married Jonah PALMER‘s daughter Mary. 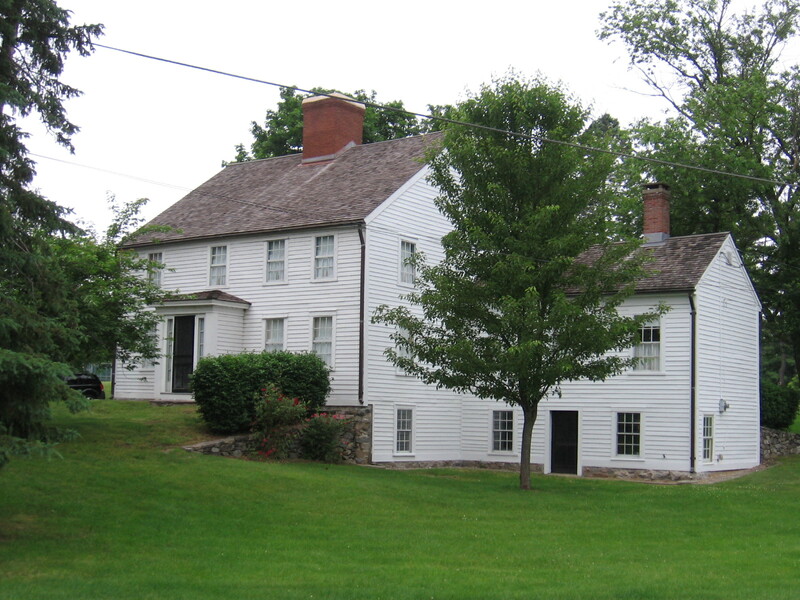 The farm was presumably inherited by Joseph’s son Israel, a cooper, in 1727. 6. Hannah Sutton (1637-1642) died as a five-year-old in Rehoboth. 1. JOHN3 SUTTON (HENRY2, THERON1) was born Abt. 1593 in Attleborough, England, and died June 01, 1672 in Rehoboth Island, RI. He married JULIAN LITTLE Abt. 1616 in Attleborough, England, daughter of FRANCES LITTLE. She was born Abt. 1595 in England, and died June 04, 1678 in Rehoboth Island, RI. In my ten years of research on the Suttons, I have accumalated a small Sutton library that consists of 14 Sutton notebooks, census records, Sutton histories, probate records, wills, death and birth certificates, CD’s, books, and various Sutton lineages. I have made a study of various Sutton branches to determine how each one connects. By no means am I an authority on the Suttons. My claim on Sutton knowledge is based on my research and the documents I have collected. I have two Sutton lines in my family. I married a Sutton from Arkansas, and my mother’s maiden name is Sutton. This Sutton history is from my mother’s Sutton family. I have come to the conclusion, after ten years of research, that John Sutton and Julian Little are my mother’s Sutton ancestors. John Sutton arrived in the port town of Hingham, Mass. in 1638 from the town of Attleborough, England. He arrived on the HMS Diligent of Ipswich. The Master was John Martin of said Ipswich. This passage can be found on page 62 of, “The New England Historical and Genealogical Register, Volume XCI, 1937. After checking over the records, I have found that the, “History of the Town of Hingham” is the most accurate. In the two passages from Banks’, he gives different information each time. In Banks’, “Planters of the Commonwealth,” he has listed: John Sutton, Mrs. Elizabeth Sutton, Hannah Sutton, John Sutton, Jr., Nathaniel Sutton, and Elizabeth Sutton” on the Ships Passenger List. This family is the Family of John Sutton, Jr., Elizabeth House, and their children. He has confused the family of John and Elizabeth house Sutton with that of John Sutton and Julian Little. I have a copy of John Sutton Jr.’s will. The will names his wife as Elizabeth Sutton, and his children as: John Sutton, Nathaniel Sutton, Nathan Sutton, Hannah Sutton, Elizabeth Sutton, Sarah Sutton, and Hester Sutton. John Sutton, the passenger on the Diligent, who removed in 1643 to the town of Rehoboth, a place of religious tolerance, died there 1 June 1672 ( Vital Records of Rehoboth, p. 879; Mayflower Decendant, vol. 19, p. 165). This passage can be found on p. 62, 63 of, “The New England Historical and Genealogical Register,” volume XCI. 2. ” In the Rehoboth records will be found the burial of Julian Sutton, his widow, 4 June 1678, whom Savage ( vol. 4, p. 254 ) mistook for a man and stated that ” no more is known of him.” This passage can be found on page 63 of, ” The New England Historical and Genealogical Register,” Volume XCI, 1937. 2. i. JOHN4 SUTTON, b. 1617, Attleborough, England; d. 1691, Scituate, Mass. ii. ESTER SUTTON, b. 1625; m. RICHARD BOWEN. iii. MARY SUTTON, b. 1626; m. (1) JOHN FITCH; m. (2) THOMAS ARMSBEE. iv. ANN SUTTON, b. 1627; m. JOHN DAGGETT. v. MARGARET SUTTON, b. 1630; m. JOSEPH CARPENTER. vi. HANNAH SUTTON, b. 1637, Attleborough, England; d. October 1642, Rehoboth Island, RI. 2. JOHN4 SUTTON (JOHN3, HENRY2, THERON1) was born 1617 in Attleborough, England, and died 1691 in Scituate, Mass.. He married ELIZABETH HOUSE January 01, 1660/61 in Scituate, Mass., daughter of SAMUEL HOUSE and ELIZABETH HAMMOND. She was born October 23, 1636 in Eastwell, England. Marriage: January 01, 1660/61, Scituate, Mass. i. ELIZABETH5 SUTTON, b. October 20, 1662, Scituate, Mass; m. RICHARD MANN. 3. ii. JOHN SUTTON, b. February 28, 1663/64, Scituate, Mass. iii. MARY SUTTON, b. January 23, 1664/65, Scituate, Mass; d. Haverhill, Mass; m. JOHN GUILE. iv. SARA SUTTON, b. November 03, 1667, Scituate, Mass. v. HANNAH SUTTON, b. November 03, 1669, Scituate, Mass. vi. HESTER SUTTON, b. October 25, 1671, Scituate, Mass. 4. vii. BENJAMIN SITTON, b. March 22, 1673/74, Scituate, Mass. viii. NATHANIEL SUTTON, b. July 31, 1676, Scituate, Mass; m. MARY RAY. ix. NATHAN SUTTON, b. August 06, 1679, Scituate, Mass; d. 1715; m. ABIGAIL. by Eugene Cole Zubrinsky, FASG Ojai, California, 2008 Last revised 18 October 2011 Prepared for Carpenters’ Encyclopedia of Carpenters 2008 Update. This entry was posted in 13th Generation, Double Ancestors, Historical Church, Immigrant - England, Line - Shaw and tagged Hingham Pioneer, The Diligent 1638. Bookmark the permalink. One of the source citations on your John Sutton webpage is obsolete: The Joseph3 Carpenter sketch, formerly at , is now at . The material contained therein pertaining to Julian Adcocke, moreover, was significantly updated on 18 October 2011. Also, keep an eye out for “Julian Adcocke, Wife of John1 Sutton of Hingham and Rehoboth, Massachusetts, and Their Family,” which will probably appear in the October 2012 issue of the _New England Historical and Genealogical Register_. While I’m gratified that you would think enough of my work as to repeat entire paragraphs verbatim, perhaps when doing so you wouldn’t mind using quotation marks and explicit citations. Thanks. In case URLs, regardless of surrounding punctuation, are automatically deleted from comments posted to this website, one may find the same item by entering “carpenter cousins joseph3” or “carpenter sketches” in his/her browser’s search field. Thanks for not coming down to hard on my potential plagiarism. My primary goal is sharing interesting stories about our forebearers. I don’t footnote each biographical fact, though I try to include links to the original sources. I usually try to attribute, indent and italicize extended quotations, but I must admit I’m more consistent at this now than I was at the beginning. I’ve updated the link to your article, better cited your work in this one, (admittedly, not to journalistic standards) and added a citation at the top of my Joseph Carpenter article https://minerdescent.com/2010/06/15/joseph-carpenter/ acknowledging your scholarship. Lately, I’ve been concentrating on 19th Century cousins who were living after 1850 where I can do some original research of my own based on family census records. Sorry, I inadvertently used a lower-case j, which should have been upper-case. The correct URL is http://carpentercousins.com/Joseph3_Rehoboth&Swansea.pdf. Coat of Arms removed. In reality, John Sutton was not part of the gentry and did not have a coat of arms when he came to America.